If proof were needed that emerging market bonds are gaining acceptance as a mainstream asset class, (see Figure 1, below). 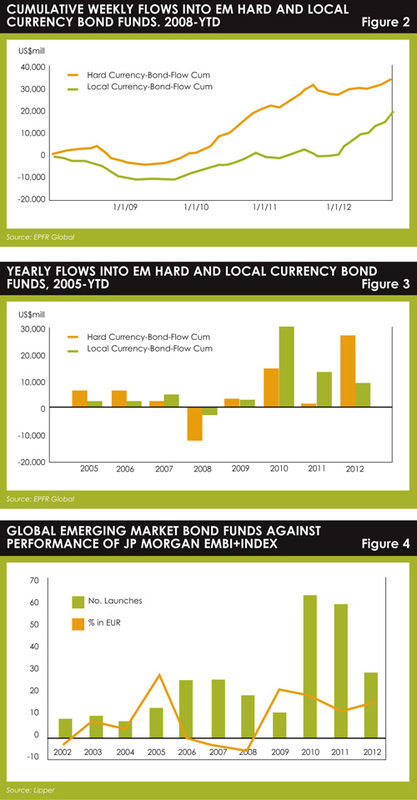 In the early years of the last decade, there were about ten global emerging market bond funds launched per year. But in 2010 and 2011, more than 60 such funds in each year hit the market. Why the sudden interest in emerging market bonds? Investors are looking for yield, of course. Bonds from developed markets such as the US, UK and Germany offer very low or even negative real yields because of slow economic growth and the effects of quantitative easing policies. Emerging markets offer fixed income investors the potential of higher returns. Bonds in emerging countries also have the potential to outperform equities in those same markets. The JP Morgan EMBI+ rose more than 15% in the first nine months of this year. In contrast, the MSCI Emerging Markets Index is up about 9%. Asset managers have continued to launch new funds in this space this year, though at a slower rate than in 2011. 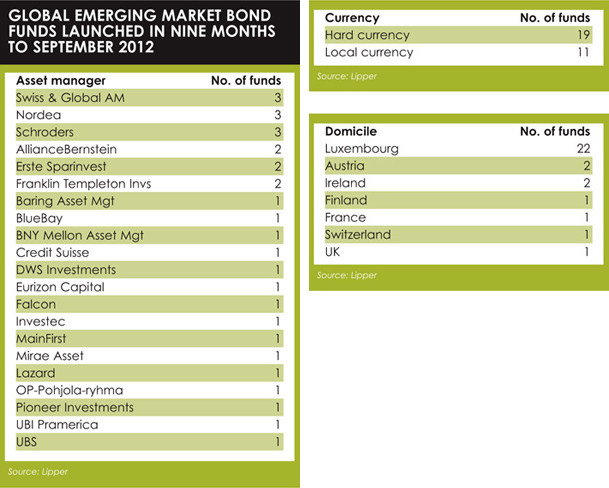 In the nine months to the end of September there were 30 emerging market bond funds launched. Unless a flurry of products come to market in the final quarter, there will be fewer products launched this year than in either of the previous two. However, it will not be a weak year – 2012 has already seen the launch of more emerging market bond funds than any year prior to 2010. There has been an increase in issuance of bonds in local emerging market currencies in recent years, and asset managers have responded by launching funds that invest in these securities. J udging by this year’s launches, though, hard currency bond funds are still the bigger group. Eleven of the 30 emerging market bond funds launched in the first nine months of 2012 were invested in local currency bonds, compared with 19 that targeted hard currency denominated bonds. Many investors believe hard currency debt to be preferable to bonds issued in local currencies, because it is more stable and less subject to currency risk. However, data on fund flows suggests local currency bond funds have been the more popular type in the past few years. Figure 2 shows that emerging market local currency bond funds tracked by data provider EPFR Global have attracted more than $30 billion (€23 billion) since 2008, compared to about $20 billion for local currency bond funds. Figure 3 shows inflows into these fund types since 2005. Both fund types saw outflows in 2008 and 2009, but local currency debt funds had fewer redemptions and attracted more in the years that followed. However, this year has been an exception so far. Flows into emerging market local currency bond funds have been relatively steady for the past 12 months, while emerging market hard currency funds have seen inflows of nearly $20 billion in just nine months. When looking back at the number of emerging market bond fund launches in previous years, it is interesting to note the connection between good investment performance and product development. If emerging market bonds perform particularly well in a given year, it is a good bet that there will be an increase in the number of emerging market bond funds launched the year after. In 2005, JP Morgan’s EMBI+ index returned 29% (Figure 4). 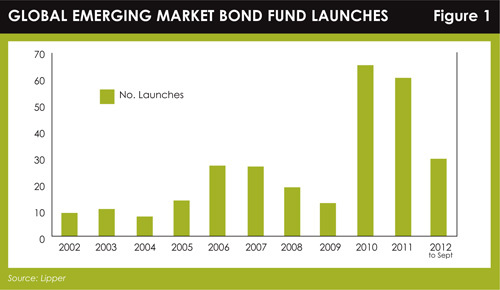 The next year, the number of emerging market bond fund launches was 27, almost twice as many in the previous year. A similar thing happened in 2009, when the index returned 22%. The next year set the record for emerging market bond fund launches: 66. Perhaps this should be no surprise. After all, investors react to good market performance and seek to allocate money to assets that have performed well. Asset managers can respond to or indeed anticipate this need with product launches. This suggests, then, that if the JP Morgan EMBI+ index continues to rise this year and perhaps ends the year at above 20%, then 2013 could be a bumper year for emerging market bond fund launches.